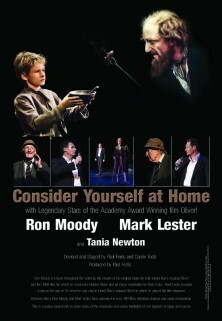 Consider Yourself At Home with Legendary Stars of the Academy Award Winning film Oliver! Ron Moody is best known throughout the world for his award-winning role as Fagin in Lionel Bart’s stage and film musical Oliver! for which he received a Golden Globe and an Oscar nomination for Best Actor. Ron Moody’s career has spanned six decades. He has worked as an actor, composer, singer and writer in a variety of genres, with starring roles in Mouse on the Moon, Mel Brooks’s The Twelve Chairs, Summer Holiday, A Kid in King Arthur’s Court and many, many more. Mark Lester became a star at the age of 10 when he was cast in Lionel Bart’s musical Oliver! in which he played the title character. Other film credits include Melody, Run Wild, Run Free, Then Came Bronson, Eyewitness, Night Hair Child, Whoever Slew Auntie Boo?, Scalawag, La Prima volta sull’erba, Crossed Swords and many more. He has just appeared in the film 1066 as King Harold II .